I had a terrible time finding a copy of this play at the library and finally gave in and bought it, a decision I have never regretted. It is one of the funniest and most intelligent plays I have ever read and has now been one of my favorites for many years. 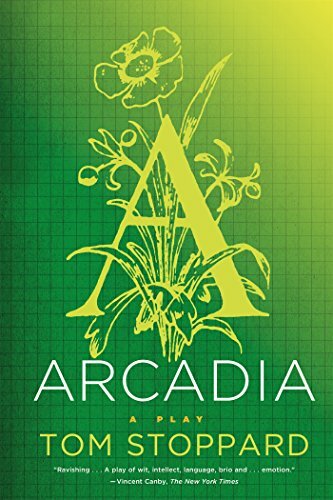 As a non-math person (not completely hopeless, but definitely not gifted either), Arcadia can be a fairly challenging read. Once, I understood it all once, in a flash of blinding light of the sort that probably accompanies religious conversion, but alas, the revelation didn’t choose to stick around. The rest of the time I have to be satisfied with sorta understanding the fractal stuff and being happy that I do get the literary bits. Along with being intellectually invigorating, the play is also full of wit and heartbreak: it is the play, as one critic wrote, that definitively proved that Stoppard “knows enough about hearts to break them.” My own heart broke several times, especially over Thomasina and Septimus. It’s funny, because their relationship ought to be about as squicky as they come. Not only is she 13 (later almost 17) to his 22 years, he is her tutor, and student/teacher relationships are something I’ve always looked askance at. But somehow in Arcadia, it works, perhaps because of the fundamental innocence and playfulness of their relationship, and it does break your heart to know that it’s ultimately doomed. I’ve never seen the play on stage (though I’d have given a great deal to see the original London production, with Rufus Sewell in the role of Septimus Hodge) but I hope to some day.